The other candidate I heard speak at Tuesday night’s Kane County Dem meeting was Victor Swanson. Swanson is a teacher in Batavia, and is, as far as I know, the only Dem candidate who has actually declared. The others I’ve encountered are still hedging a bit with statements to the effect that they are very near declaring. You can find Swanson’s website here. 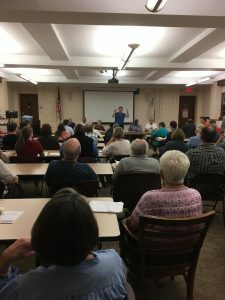 As was the case with Matt Brolley, Swanson briefly addressed the Kane Dems monthly meeting on Tuesday night. As was also the case with Brolley, I approached Swanson after the meeting to ask my two-question progressive litmus test. I found Swanson to be much more eloquent in a one on one conversation than he had been in his two-minute speech, which encourages me to believe he will become more polished in his public appearances as he goes through the campaign. He strikes me as intelligent and well-spoken, well able to think on his feet. Swanson immediately indicated he is a single-payer advocate, and in fact spoke passionately about relatives with pre-existing conditions. When asked whether he would accept corporate donations, Swanson instantly responded “I know the answer you want to hear, but I can’t give it to you.” He went on to say he’d read my post about Jim Walz and knew from reading it that I wanted to hear that he would not accept corporate donations, but felt he could not make such a commitment, as Hultgren had spent half a million dollars during his last race. Well, he’s right, I did want to hear that he would reject corporate donations. I am still waiting to hear that from an IL-14 candidate. And while I’ve noted that it’s my progressive litmus test to seek a candidate who is more interested in representing me than corporate America, I am of the opinion that taking that stand will come with it’s own set of advantages. Not least of these is the simple fact that the Dem who takes IL-14 will have to fight an uphill battle against the district’s demographics, so will need all the help he or she can get taking Independents and even making inroads into Hultgren’s Republican base. I keep hearing that “the energy is so high” and I acknowledge that, but am also very aware that IL-14 was drawn – by Democrats – as a Republican vote sink. The Dem who takes IL-14 away from Hultgren is going to have to figure out some common ground to appeal to Independents and Republicans, without bursting that balloon of Dem energy. Best way I can think to pull Independent, and even some Republican, votes over is to take a strong “I’m only accepting donations from individuals, I want corporate money out of politics and that begins with a strong stand on that in my own campaign” position. Followed quickly by a lot of finger-pointing at Hultgren’s corporate masters, naturally. I think it’s a strategic error for any Dem running in IL-14 to act otherwise as, barring some major Hultgren scandal, it’s about the only issue all sides routinely agree – fervently – upon, and you can’t win with Dem votes alone here – not even if your high energy turns out 100% of them. So, yeah, I’m still waiting for that progressive candidate who can take advantage of that issue to turn IL-14 blue. This entry was posted on Thursday, April 27th, 2017 at 2:46 pm	and is filed under The Front Page. You can follow any responses to this entry through the RSS 2.0 feed. You can skip to the end and leave a response. Pinging is currently not allowed.